LuxCloud, a Luxembourg-based leader in cloud services provisioning, is pleased to announce its first workshop for digital communication agencies, where it will reveal two tools to help local small and medium-sized businesses (SMBs) harness the power of social media for their marketing. Taking place on October 20th in Luxembourg City, the workshop will introduce the startups behind the tools MyGoodClient and Soshlr to the Grand Duchy, and allow digital agencies to try out the marketing platforms first-hand. MyGoodClient, from Italian startup 142, is a platform that uses social media to take advantage of word-of-mouth promotion. It makes it easy for business owners to create incentives for clients to share with their social network, resulting in satisfied existing customers and the acquisition of many new ones through personal recommendations. Soshlr, created by U.S.-based Manalto, allows businesses to manage all of their social media accounts from a single dashboard, scheduling campaigns and assigning different team members to tasks. The tool makes it quick and easy for businesses of any size to stay on top of their social media, without having to log into many different platforms. 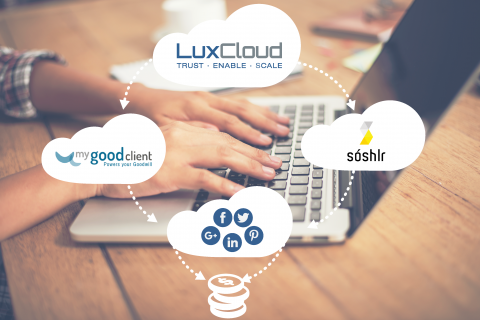 LuxCloud makes it possible for companies around the world to resell cloud tools. It is now launching an offer designed with digital agencies in mind, which allows them to provide their clients with a custom package of value-added cloud services. Now, through LuxCloud, digital agencies can not only provide their clients with web hosting, professional email and domain names, but also the tools to help them further promote their business.